This dish came together rather serendipitously on a Sunday afternoon. I was up to my elbows testing recipes and was looking for something savory for dinner that didn’t require too much prep, or dishes afterward. I’d brought home some colorful radicchio from the market, I had some bacon (don’t I always? ), and there was a packet dried mushrooms in a kitchen drawer. So I gathered everything up and searched through my grains, to see what was in there. I eat a ton of pasta, specifically whole grain pasta, which I can’t resist, especially if there’s garlic or radicchio involved. (And bacon, of course.) But in between a few bags of pasta was a small sack of petit épeautre (wheat berries) and a similar-sized bag of something unlabeled, which I was sure was farro. Whatever it was, the two bags came out to about 1 cup, which was just the right amount to make a wheat berry risotto, or farrotto. Anyhow, back to the food. This was a huge hit. 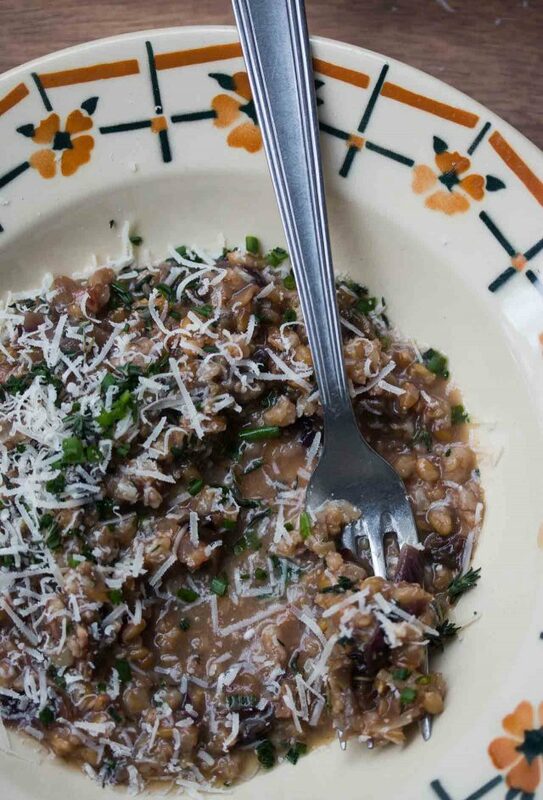 The dried mushroom broth added a deep richness that stock alone doesn’t always give, and the slightly bitter radicchio was tempered by the bits of bacon and creamy Parmesan that melted into the wheat berries. Cracking the wheat berries after they’re cooked helps them release more of their starch, so you get something that’s more emulsified than if you just cooked wheat berries as they are. Earlier in the week, I felt a bout of la grippe (the flu) coming on and Romain went to the store to get a chicken for soup, and I made a big pot in preparation for being laid up a few days. I wasn’t paying that much attention, as one does when they are in the early stages of the flu, and ended up with quite a bit of liquid in my soup, which I used as stock for this. Fortunately, it was just a mini-bout of le gastro, and I felt better the next morning. I know in the U.S., canned or boxed stock is a staple in most supermarkets. 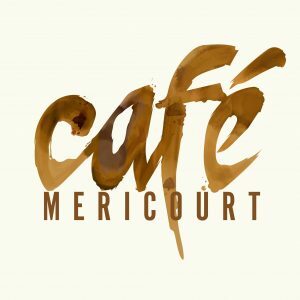 In France, they rely on le cube, which I’m not fond of, so I try to make my own stock when I can. I don’t use a recipe, I just add a chicken carcass (I often save parts and bones in the freezer for when I’m ready to pull out my stock pot), then add a chopped onion, a carrot or two, a bay leaf, and a few sprigs of thyme, then let everything simmer for a few hours on the stove. In addition to not coming down with the flu, I was really happy with how this came out. 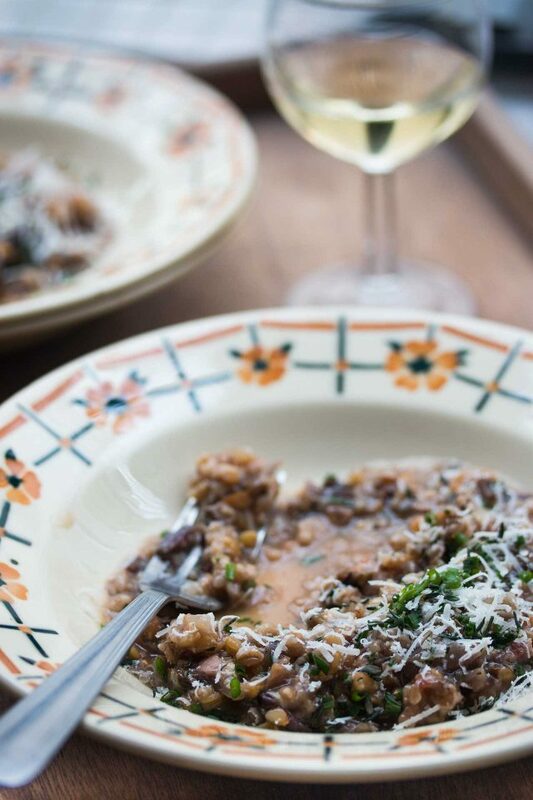 It’s much heartier than risotto and less fussy; it’s one of those dishes where all the ingredients come together, and compliment each other, homey enough for a Sunday night dinner, but I’m thinking of making it again next week when I have company. Different wheat berries (and farro) may take different amounts of time to pre-cook in step 2. You want them slightly tender, a little less than half-cooked, not completely cooked. Feel free to play around with the recipe. Omit the bacon if you're vegetarian, replace the radicchio with other stewed greens, or add herbs that you like, sage and rosemary are possible swap-outs for the thyme. 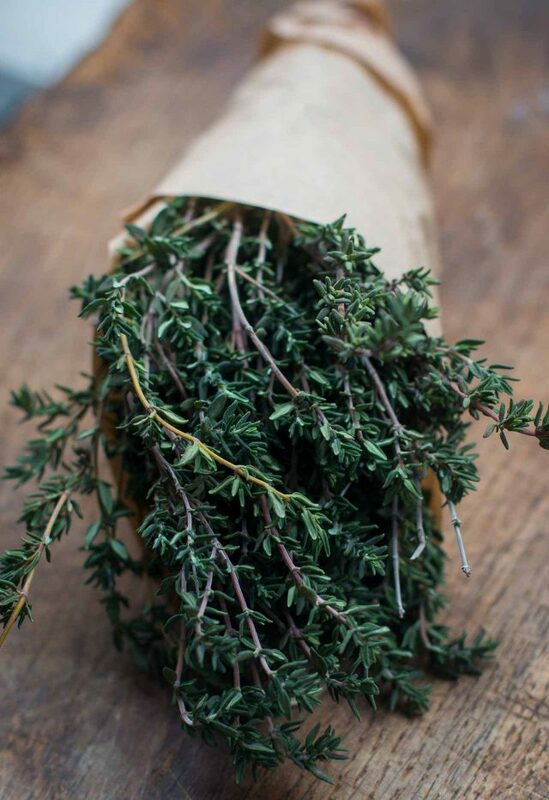 (If using rosemary, go easy on it as the flavor can be overwhelming.) You could add sautéed mushrooms, bits of cooked chicken, or roasted squash in step 9.I used dried porcini mushrooms, which are available at some produce stores and well-stocked supermarkets, but you can use whatever dried mushrooms are available, or another favorite. Some dried mushrooms may need to be cleaned by soaking in a change of hot water once or twice, although mine didn't. 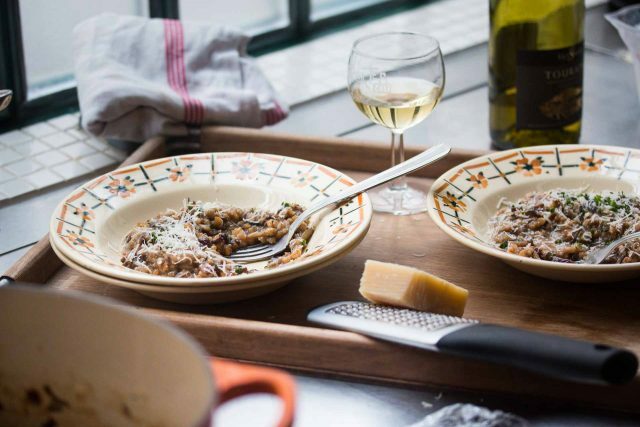 Follow the instructions on the package or ask the vendor how best to treat yours.Serve the risotto/farrotto in warm soup bowls or plates, mounding it in the center. Shave Parmesan over the top, and sprinkle with additional fresh herbs. 1. Put the dried mushrooms in a small bowl and pour the hot water over them. Set aside for 20 to 30 minutes. 3. In a small bowl, mix the minced shallots and garlic. In a medium skillet, heat some olive oil and cook the bacon, stirring, until cooked through but not crisp. Transfer to a paper towel-lined plate to drain and cool. Drain off excess fat, wipe the pan clean, and add the radicchio. Cook the radicchio over medium heat, stirring constantly with a little of the shallot and garlic mixture, and a pinch of salt, until wilted. You may need to add a little olive oil if the radicchio sticks. 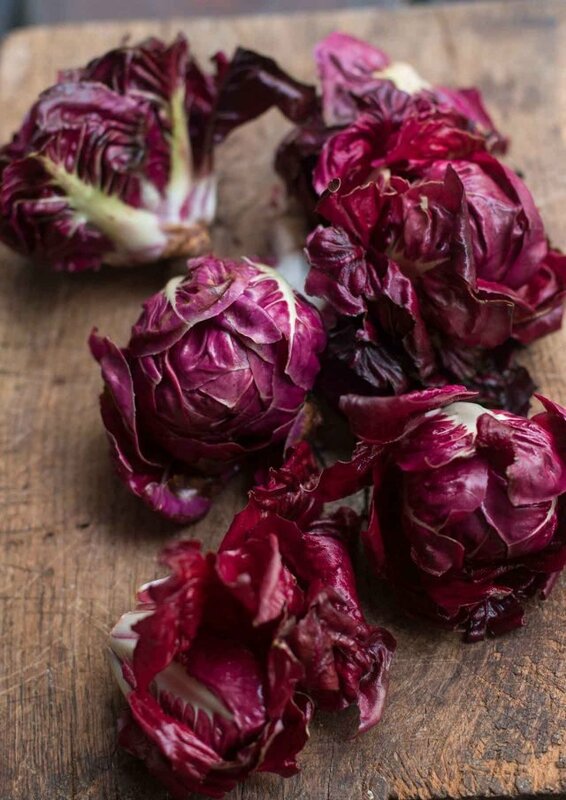 Transfer the radicchio to a plate. 4. Squeeze the mushrooms dry and coarsely chop them. Put them on the plate with the radicchio. 5. Heat the stock in a saucepan and keep it warm on the stove. 6. In a 4- to 6-quart (4-6l) casserole or Dutch oven, heat some olive oil with the butter, sprigs of thyme, along with the remaining shallots and garlic. Cook over medium heat, stirring frequently, until the shallots and garlic are soft and fragrant, about 2 to 3 minutes. 7. Add the drained farro or wheat berries and stir to combine with the shallots and garlic. Add the white wine and continue to cook, stirring, until the wine is absorbed. 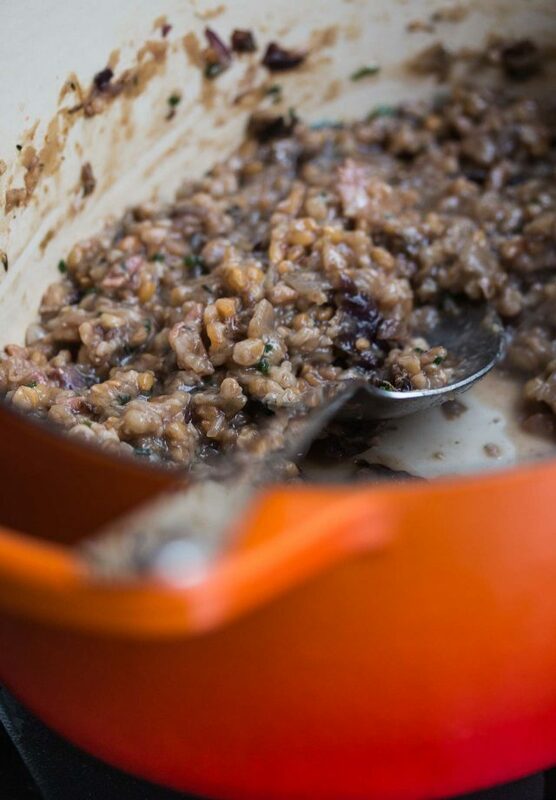 Using a ladle, add enough of the warm stock to cover the farro so there is a layer of liquid about 1/4-inch (1cm) floating on top. Adjust the heat so that the mixture is simmering. It should be bubbling gently, not boiling. 8. Continue to cook, adding additional stock (about 1/2 cup/60ml at a time) as the layer of liquid on the top gets absorbed, while stirring. When two-thirds of the stock has been used, add the mushroom liquid and continue to cook, adding more stock and stirring. The process will take 20 to 30 minutes.You may not have used all the stock. If you need a bit more liquid, use the reserved cooking liquid. 9. 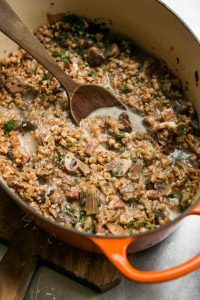 When the farro has softened add the bacon, radicchio, chopped dried mushrooms, and minced thyme. Cook a few more minutes, plucking out the thyme branches and adding the grated Parmesan. Stir while the mixture simmers, until everything is absorbed and incorporated. 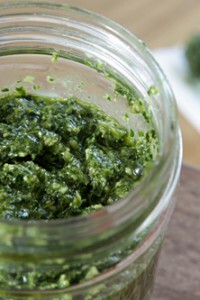 Serve on warm soup plates with additional grated Parmesan and a sprinkling of fresh herbs. I have never seen farro at the supermarket here, but blé is common. I’ll have to try the bio store. As much as I love risotto, it can be a bit starchy (maybe because I eat big portions?). This seems like a healthier and heartier alternative. I just saw an episode of America’s Test Kitchen or it could have been Cooks Country and they did a Farrotto and they puled the dry farro in a blender 5 or 6 times to crack some but leave others whole. Then they continued with the Farrotto. They also added most of the liquid to start the reason was the simmering would also release starchiness. This method was much more “hands off” than adding measured amounts of broth in various stages. I just may have to try both methods. I have never bought farro or wheatberries, although I have thought on it. I will now and give this a try. Why not just use some of the bacon fat instead of olive oil and then butter? It would certainly add flavor. 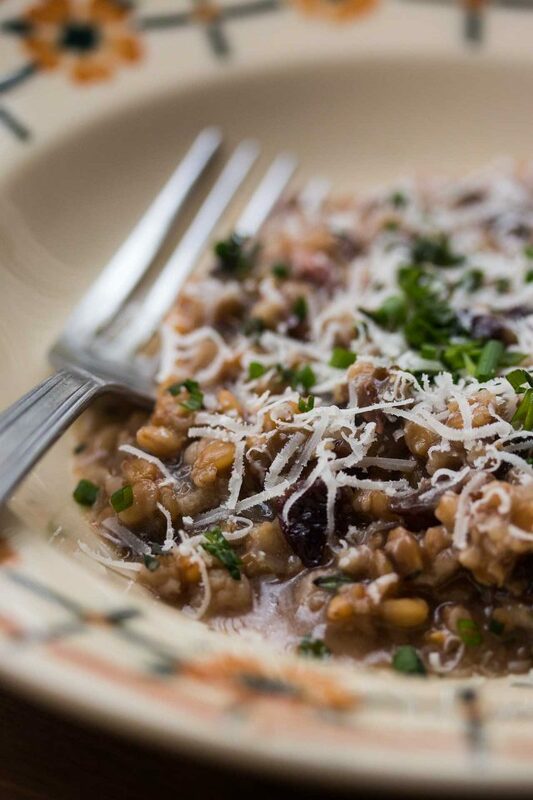 Farro is one of my favorite grains and I always appreciate new recipes. Taste of France: You wouldn’t find farro in a supermarket in France but some Italian food shops carry it. AJPeabody: The bacon in France doesn’t throw off as much liquid, or fat, as bacon in the U.S. (although that’s mostly commercial bacon, I think) so usually some oil is needed. But you can certainly use the bacon fat if you have enough of it. Nikki P: I’ve not tried putting them in a blender prior to cooking, but do so a bit after they’re cooked. Using an immersion blender is easier and less clean-up, but if you try it their way, let us know how the “risotto” turns out. 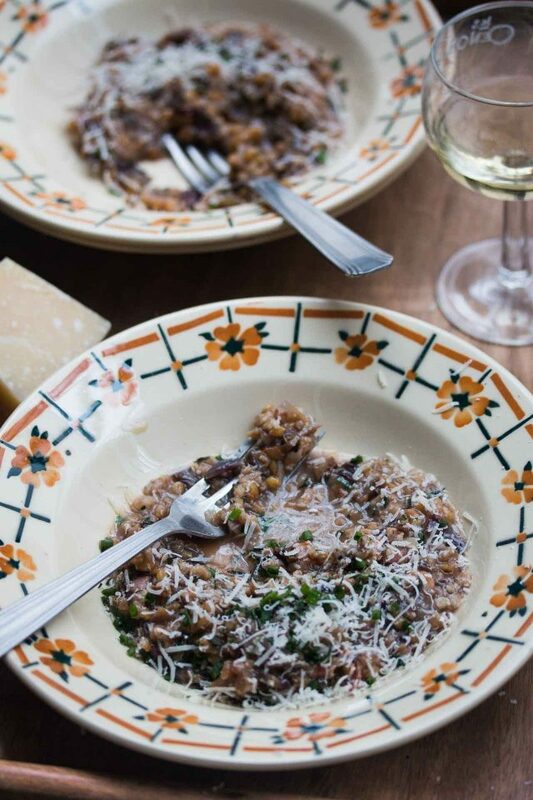 I’ve made a similar risotto using radicchio and bacon … and red wine instead of stock. I don’t think I can do the farro version as I have celiac disease (I must check that), but I really fancy making a rice-based version of this soon. I just made a farrotto last week using dried and fresh mushrooms. Everybody loved it. Very hearty and satisfying. Dinkel (spelt) is pretty much the same thing as the petit épeautre David uses. god i love that stuff! I live in Napa (home to Rancho Gordo beans!) 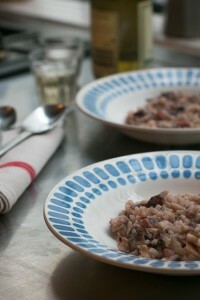 and add Farro to most of my bean dishes. Adds wonderful taste and mouth feel. Wow! I cleaned out my chicken parts bag and made stock today, I have fresh thyme in the garden and radicchio in the fridge (a rarity, as I must travel at least 100 miles to find a store that stocks radicchio), I have dried porcini in the pantry, and I am traveling over the weekend, coming home to minimal prep time for dinner. No farro or wheat berries, alas, but I am betting with arborio, it will still be delicious. Looking forward to Sunday night! So David, As soon as I saw your evening dinner in Paris, I tried to make a reservation for 3 (ourselves and our daughter) but you were booked. What’s up with that?!?! We would have taken either 7:30 or 9:30. We’re in Paris that week from NJ, USA and I’m just tried so sign up as soon as I saw your post. I’m VERY disappointed!!!!! Apologies. The restaurant can only accomodate a certain number of people (like most places in Paris, it’s not a large space) and it sold-out. I don’t know if they are keeping a waiting list, but you could inquire. 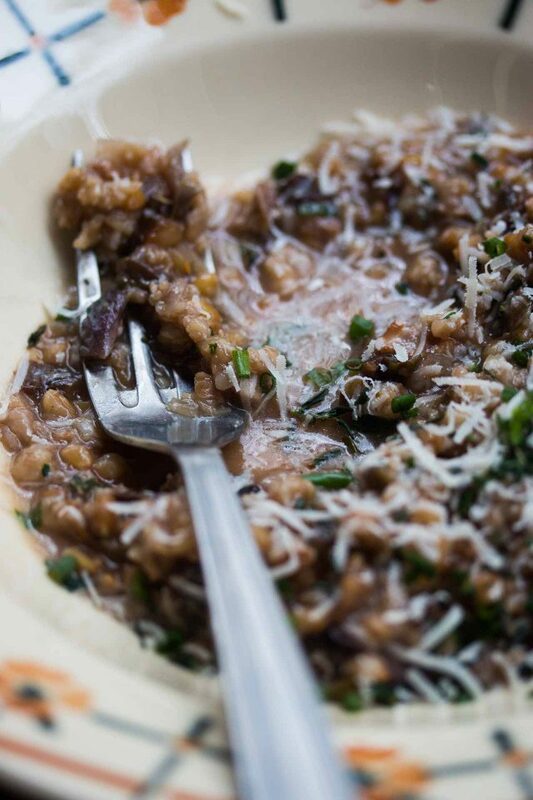 I recently tried a buckwheat “risotto” as I am gluten free- I soaked the groats overnight and then proceeded with a traditional risotto preparation. I must say that the buckwheat was lighter than I imagined it to be! And really satisfying! Buckwheat is great. I love it. There are two kinds: not toasted (light in colour) and toasted (brown in colour). I love my buckwheat toasted. You can boil it in 5 minutes and then add it to the sauteed garlic, onions, peas, carrots, asparagus, chopped nettle, spinach, boiled eggs, etc. Add a dollop of smetana mixed with dill. Beautiful. 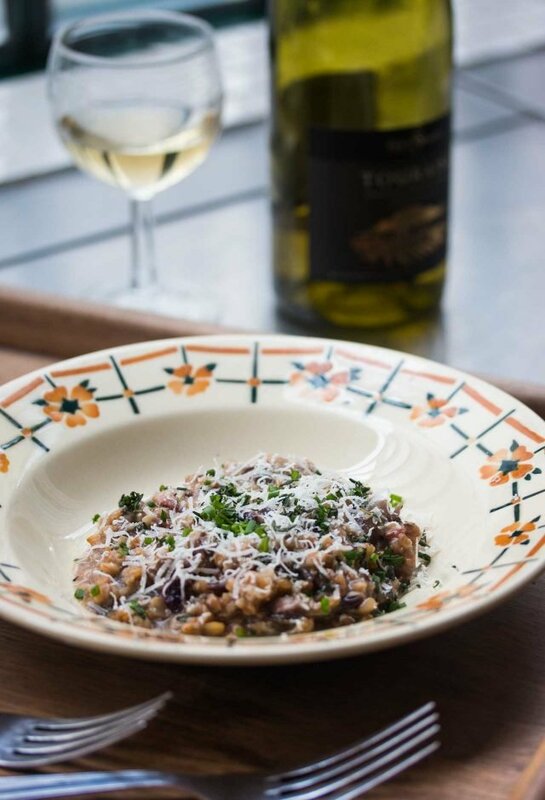 Lovely to see a risotto alternative using whole grains. And I like your cunning plan to get Romain to go to the store for chicken!:). I make my risotto with barley. (Be aware of pearl barley, which is stripped from its outer layer and is not as nice.) Barley has a beautiful wholesome nutty flavour and is very healthy. Cooks a touch longer than rice and pearly barley. You can get real barley in Eastern European shops. Make sure it is not pearl barley, parboiled or crushed. I weigh all ingredients as I go, using a scale that’s in ounces and grams. My conversions for sugar and flour are the same as Clotilde and Cenk, who live in France and Turkey, respectively. I use the minimum amount of sugar that makes the desserts taste right to me, and will provide the best texture. If you want to reduce the sugar, you can read more here. My suggestion is to check out baking books that feature reduced sugar recipes. Two that I recommend are Baking with Less Sugar and The Sweet Spot. David, you have white wine in all these photos, but you haven’t shared what you paired with this… and I’m dying to know! It was a few days ago (we drink a lot of wine in France…!) but am reasonably sure it was a Muscadet. I like white wines from the Loire in general. Muscadet has been traditionally paired with oysters but has gained some traction, and popularity, recently. I made this dish for dinner tonight and it was sooooo good. I will make this again and again. I used both fresh and dried mushrooms. I cooked the fresh mushrooms in the bacon fat and then had Marsala wine in the pantry, so used that to deglaze the pan before adding the rest of the ingredients. Love this recipe. Why are you discarding the bacon fat and using fresh olive oil each time you need to add a new component to the pan? Would the smoked flavor overwhelm everything if it was the consistent fat source for cooking the radicchio and then the shallots and garlic?